Standing atop a single pylon of a futuristic bridge, UFO Observation Deck offers panoramic vistas of the Old Town against the backdrop of the Small Carpathians. The view also encompasses the brightly colored suburbs and industrial areas of Bratislava as well as Austrian and Hungarian landscapes. Take the elevator to reach the circular deck, equipped with telescopes, explanatory graphics, and a free binocular. Just below the deck is the city's highest lounge and restaurant decorated in a 1960s style. Under the tower sits a popular beach. 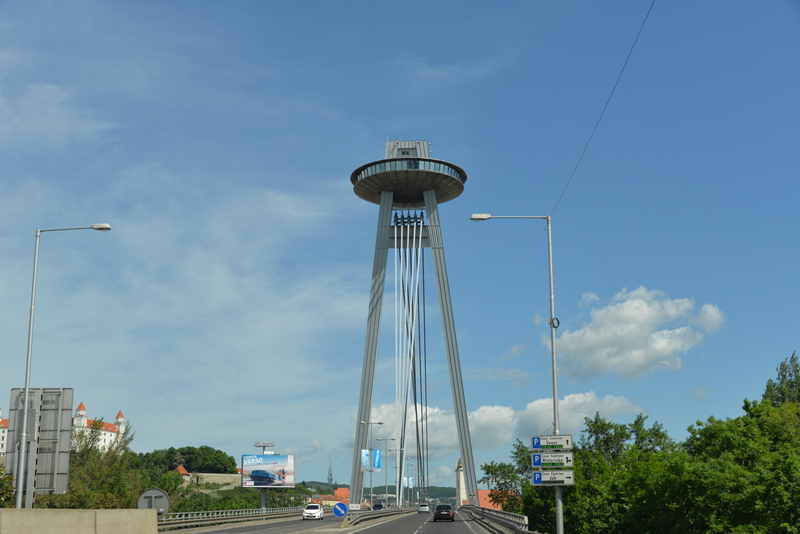 Plan to see UFO Observation Deck and other attractions that appeal to you using our Bratislava trip planner . Review platform and rather expensive restaurant in one bottle. The platform can be separately visit-elevator will request to the restaurant, and then climb the ladder a bit will have excellent types-overview of 360 degrees, it is better to can not find anywhere else in the city. Is on a new bridge. In just some words: great to see, terrible to drink. You can see the whole city from the top of the building, with little drawings, so you can check every famous buildings location. They also have a cute heart shaped love-lock-holder if someone wants to clip their love up there. So that is really good. Which is not good (after the prices, because the restaurant is expensive) is the service. First we wanted to take a seat, a guy asked us that are we going to eat? If no, you can't sit to the normal tables. You have to use a 30cm height table and chairs. In this totally uncomfortable position they served us the coffee (no lactose-free milk) and the tea, they were not bad. After a while we wanted to pay but really no waiter or waitress gave us attention, so I went inside (you can't come here if you are not eating - okay man I'd just like to pay) then a waitress came to our table and LITERALLY DROPPED THE RECEIPT TO THE TABLE - with 2 words: the check. I payed the exact amount, said "the money" and we left. (It was really hard to pay it penny-by-penny but we didn't want to give a single penny to them.) I will never go back to here even if the sight is amazing, you can see the town from the castle also. Which is also pretty beautiful. The tower has great views for the river and the city. The restaurant was good but the waiters were not so good. WC available up. Above the restaurant there is open door area to get fantastic photos. A bizarre thing that is you will buy a ticket then can take the lift, when you arrive up there is an employee in front of the lift to ask you about your ticket.!! Totally recommended. We just finished eating and drinking there. What can I say? It was one of the best meals I've ever had accompanied by one of the best views I've ever seen at a restaurant. Our server Lanka was not only cute, but spoke perfect English and gave us fantastic service, including advice on what to see around town. We got the 7 course meal and every single item they brought was just amazing. Would recommend. Brilliant views of the city and the danube. Very small queue to get in. The lift is quite small and they pile as many people in as possible each time. The cocktails and bar snacks in the restaurant are delicious. Every day, we help thousands of travelers plan great vacations. Here are some tips on how to use your Listing Page to attract more travelers to your business - UFO Observation Deck. Promote your permanent link - https://www.inspirock.com/slovakia/bratislava/ufo-observation-deck-a567315861 - on your website, your blog, and social media. When a traveler builds a plan from this page, the itinerary automatically includes UFO Observation Deck. This is a great way for travelers looking for a great vacation in your city or country to also experience UFO Observation Deck. Promoting your link also lets your audience know that you are featured on a rapidly growing travel site. In addition, the more this page is used, the more we will promote UFO Observation Deck to other Inspirock users. For best results, use the customized Trip Planning Widget for UFO Observation Deck on your website. It has all the advantages mentioned above, plus users to your site can conveniently access it directly on your site. Visitors to your site will appreciate you offering them help with planning their vacation. Setting this up takes just a few minutes - Click here for instructions.